First published in 1933, The Pilgrim’s Regress by C. S. Lewis is “an allegorical apology for Christianity, reason, and romanticism” (in the words of the subtitle). It was Lewis’s first Christian book, written over the course of two weeks (August 15–29, 1932) while Lewis stayed in Belfast with his lifelong friend, Arthur Greeves. Lewis had converted—or perhaps, reconverted—to Christianity in either 1929 or 1930 (the date is disputed by Lewis scholars) after a long intellectual sojourn through various intellectual points of view. Elements of that sojourn find their way into the book, though readers should not assume that the book is strictly autobiographical. The Pilgrim’s Regress is an allegory, self-consciously modeled after The Pilgrim’s Progress by John Bunyan. In broad outline, it traces the journey of John from Puritania to the Grand Canyon, along the canyon to the North and the South, and then across the canyon with the help of Mother Kirk so that, after he retraces his earlier steps, he comes to the Landlord’s Castle at long last. Puritania is a legalistic and judgmental form of Christianity. The Grand Canyon is Peccatum Adae, the “sin of Adam,” which separates humans from God. The North symbolized arid rationalism, while the South symbolized undisciplined emotionalism. Mother Kirk is what Lewis would later call “mere Christianity”—as opposed to the doctrine of a specific denomination, the Landlord is God, and the castle is union with God. As in Bunyan’s work, much of the action in The Pilgrim’s Regress revolves around John’s conversations with the proponents of various worldviews. In an Afterword to book’s third edition, Lewis wrote, “my own progress had been from ‘popular realism’ [i.e., naturalistic materialism] to Philosophical Idealism; from Idealism to Pantheism; from Pantheism to Theism; and from Theism to Christianity.” Broadly speaking, these isms mark John’s conversation partners throughout the book. In later works, Lewis would use the German term Sehnsucht and the English word joy to describe this longing. (Hence, he titled his memoir, Surprised by Joy). He spelled out the logic of this longing in a famous sentence from Mere Christianity: “If we find ourselves with a desire that nothing in this world can satisfy, the most probable explanation is that we were made for another world.” It is this desire that propels John along the journey and which sustains him as the various worldviews attempt to explain away or subvert it. For Lewis, we should not oppose “desire” (romanticism) and “explanation” (reason) to one another, for they work together to bring the pilgrim to God. That is the whole point of his “allegorical apology” for them both. 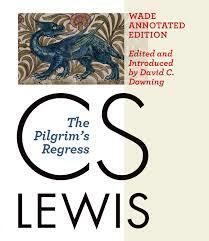 Despite the clarity of Lewis’s basic insight regarding desire and reason, the obscurity of his references makes The Pilgrim’s Regress one of his most difficult books to read. That is why the Wade Annotated Edition of the book is such a boon to Lewis scholars and fans alike. Lewis himself annotated a 1935 printing of the book for a student named Richard Thornton Hewitt. That copy is one of the holdings of the Marion E. Wade Center of Wheaton College in Wheaton, Illinois, and the basis for this edition of the book. In addition to Lewis’s own annotations, David C. Downing has added “nearly five hundred page notes, including definition of unusual terms, translations from a half-dozen foreign languages, identifications of key characters, and cross-references to other works by C. S. Lewis,” as well as selected bibliographies of works by and about Lewis. I would not recommend reading any other edition of The Pilgrim’s Progress than this one, so helpful is it. Indeed, as I read the Wade Annotated Edition, I was astonished to see the many ways in which Lewis’s Christian rational romanticism was already formed at such an early stage. Downing consistently points out how Lewis expanded on themes first mentioned here. Who, then, should read this book? As noted above, certainly Lewis scholars and fans. If you have read widely in Lewis but have not read this book, it repays careful study. It is Lewis in seed-form. Ideas present here will come to flower in his later books, whether apologetic, fictional, or biographical. The one group I would not recommend to read The Pilgrim’s Regress is people who have not read, or have not read widely in Lewis already. For them, it is better to start with the flower than the seed. Only after they see the full bloom will they have appreciation for the potential of the early germ.